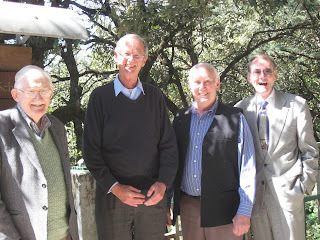 Yesterday an unusual event was held at the Principal’s House; Dr. Laurenson hosted a lunch for three former principals. After the lunch, there was a call to our office for someone to come and photograph them. Since I was the only person available right then, I went down. Bob Alter was principal from 1968 to 1978, covering the majority of the time that we taught at Woodstock. He and his wife Ellen spent the fall and early winter in their home at Oakville. Hugh Bradby was principal during the late 1980s; his daughter Kirsten is now working in the Admissions Office and he is visiting her. Jim Lehman served as interim principal during one of the many times he has been on staff; he and Betsy are here to help fill in at the Guidance Office for the semester. I'll leave the exact details of years of service to the official news item that will be appearing in the Woodstock School news.